One hundred years ago today was a great day to be in my home town of Ottawa, Illinois. 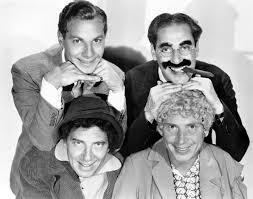 It was a century ago on January 1-3 that the Marx Brothers appeared live on stage in “Mr. Green’s Reception,” along with their company of 22 actors, singers and dancers at what was then the Gayety Theatre (which burned down in 1930, and was replaced in September 1931 by the Roxy Theatre, which still stands. The Marx Brothers also appeared in Ottawa in September of 1912, performing “Fun in Hi Skule.” Neither of these shows were ever filmed, though portions were apparently cannibalized and used in some of their Broadway shows and films. So excuse me for a little civic pride, even though I was born a hundred years too late. I’m going to go watch Horse Feathers. This entry was posted in Uncategorized and tagged 1914, Chico, Groucho, Gummo, Harpo, Marx Brothers, Ottawa, Zeppo on January 2, 2014 by howardjohnson1985.